The new Mountain Valve Stem is required for tubeless conversion using the old taping method on non-tubeless rims, or can be used as replacement valve for many UST rims. It's 35mm long to accommodate most MTB rim depths, and features a removable valve core for easier tire sealant application and hassle-free extender installation. Fits up to an 8mm valve hole. Sold in pairs. These work on rims with both schrader and presta valve holes, and so can convert a schrader rim to a tubeless wheel with a presta valve. I've used a lot of different valve stems for tubeless over the last 14 years. Stans are the original and best. I've had cheap Chinese stems fail but not the Stans. I have used Stan's rims, sealant, rim strips and now their valve stems. Stan's tubeless products have always performed well and have set the standard that other companies follow. The competition is getting better at their game because of Stan's reputation, and that's good for all riders. Work fantastically on the first try. Highly recommended. Easy to use and reliable! You'll spend far more time wrestling with your tire than you will messing with these guys. They installed easily and work fine. 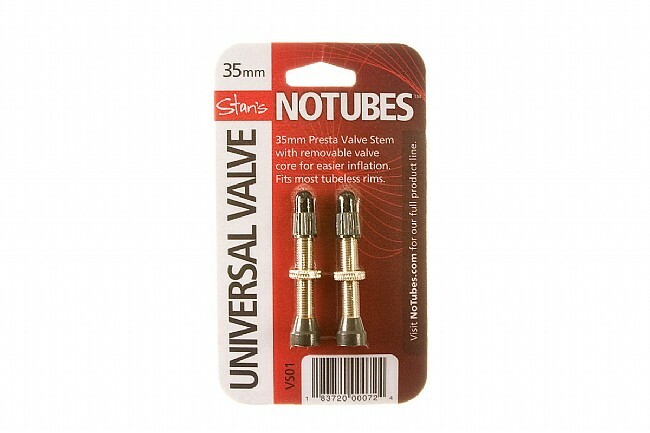 This is the first time I've tried tubeless, and I must say that the Stan's valves work flawlessly. The removable cores made it very easy to inject sealant. I've only ridden about 25 miles of trail so far, but they appear to be holding up just fine. No leaks. They really don't seem to be very fancy to justify the high price, but if they last, I suppose they're worth it. Biketiresdirect does often have the best price.